Posted November 20, 2018 by Melrose Dental Arts & filed under Dental Implants. Tooth loss can disrupt your life in all kinds of unanticipated ways. If you’re missing one or several teeth, you may not be able to comfortably chew the foods you used to enjoy. The missing tooth can also disrupt the other teeth in your mouth. Without the structure and alignment of your full set of teeth, your remaining teeth may start to shift. This can cause your teeth to wear down, due to the unevenness of your bite. To recover from tooth loss, you need a powerful dental prosthetic. A dental implant allows for comprehensive recovery. You have a number of prosthetic options when it comes to replacing a tooth, but dental implants deliver the most comprehensive recovery. 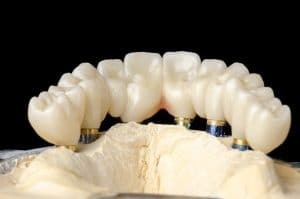 Dental implants are free-standing, which means they don’t rely on your neighboring teeth for support, like a dental bridge would. Implants also recreate the structure of your tooth root. Rather than giving you a surface-level recovery, the implant is surgically placed in your jawbone, so it restores much of the function, in addition to the appearance, of your original tooth. To start your tooth loss recovery treatment, you’ll work with your dentist. You can get a recommendation for an oral surgeon who can place the titanium post in your jaw. Then, your dentist can fabricate a custom-crafted dental crown to sit atop the dental implant and complete the restoration. Your prosthetic will not only look like a natural tooth, but it will work like a natural tooth as well. Your oral surgeon will take x-rays to determine whether or not your jawbone is stable enough for the treatment. If you’re ready to get started on your road to recovery from tooth loss, turn to Melrose Dental Arts. Dr. Amiri and his team will develop a treatment plan that gets you the help you need. After you receive your dental implant, you’ll be amazed by how it improves your ability to eat. To set up your initial consultation for a dental implant, contact Melrose Dental Arts in Vista, CA at 760-724-9117.